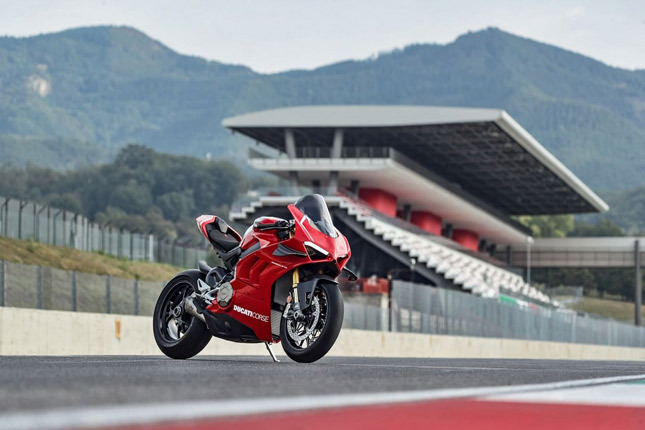 1: Involvement of Ducati Corse Racing team: The V4 R exists in an elite category of motorcycles, which tread the line between prototype and production. 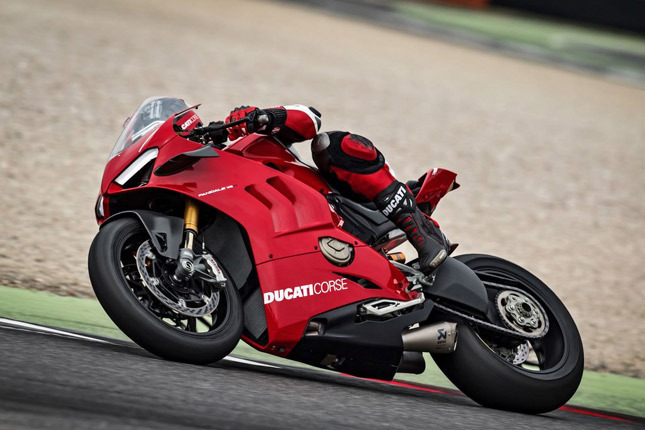 The Panigale V4 R was heavily designed and developed by Ducati Corse Racing team. 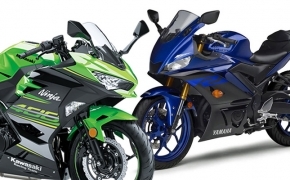 They have left their mark on the bike as well, thus further accelerating its exclusivity. 2: Everything is aerodynamic: On the V4 R, everything is aerodynamic, the front nose, the side panels, along with the windscreen are designed by keeping only two things in mind, maximum speed and minimum drag. 3: Better cooling: The Panigale V4 R offers better cooling due to the increased efficiency of the air intake system and repositioned air vents for better heat dissipation. 4: Lighter engine: The new engine uses Titanium conrods and intake valves along with forged steel crankshaft with reduced stroke. Lighter engine components mean more easily they can be turned. As a result, the redline of the bike is placed at 16000 RPM. The engine also has an improved compression ratio and offers even better refinement levels due to a counter-rotating crankshaft. 5: Power Bump: In stock mode, the 998cc engine makes 221 HP, which can be further increased to 231 HP with the help of a Ducati performance exhaust from Akrapovic. 6: Carbon-Fibre wings: Probably the most head-turning feature, are its wings, which are placed on the engine cowl on either side. They are made out of carbon fibre and are designed to reduce the intervention of onboard electronics. 7: Ohlins everywhere: The front and rear suspensions are fully adjustable, delivered Ohlins. 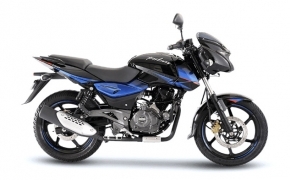 The steering damper too is supplied by the same company, for maximum synergy. Among them, the ABS is adjustable for 3-levels. Traction controlled is adjustable for 7-levels. Slide control can be managed for 2-levels and lastly, wheelie control can be configured on 7-levels. An Inertial measurement unit helps in the precise use of all the above electronics. 9: New Riding Modes: There are 3 riding modes, namely Race, Sport, and Street. 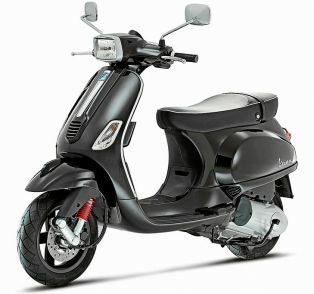 Full 221 HP is available in all the riding modes, only the level of electronic intervention differs. Race mode will allow you to unleash 221 horses without any intervention while the street mode will have the maximum amount of intervention on your riding. 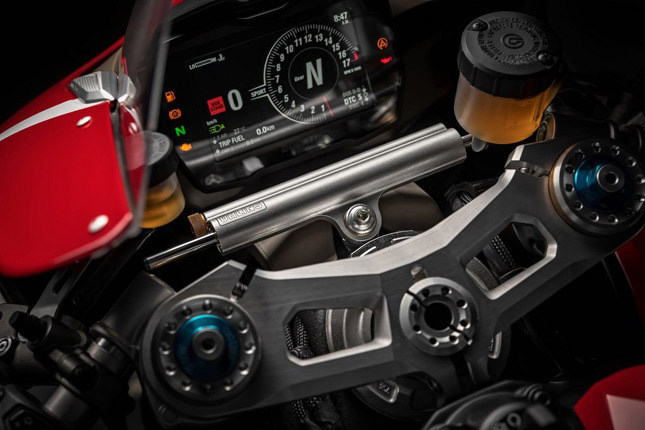 10: A pit limiter switch: The Panigale V4 R is so race focused that it even comes with a pit-limiter switch. Its job is to limit the bike’s speed to 80 Km/h, so the bike can easily be ridden in the pit lanes. Without a doubt, the Ducati V4 R is a track bike with headlights. 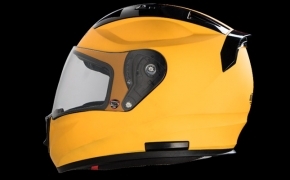 It is legally homologated for the WSBK and is likely to make its debut in the coming year. Kawasaki has had the upper hand since the last 4 seasons, and their rider, Jonathan Rea is on a roll with more than 50 wins under his belt. Thus it’d be nice to see the Ducati, rising up to the challenge once again. The all new Ducati Desmosedici Stradale V4, just the name of this thing makes it sound like the big monster created by an insane scientist. The engine weighs in at just 64.9 kg; Desmosedici Stradale is just 2.2 kg heavier than super Quadro twin which has a cubic capacity of 1285 cc. 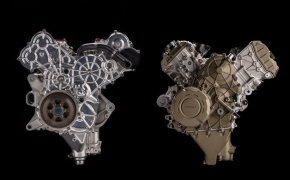 The origin of this engine has its roots in the soul Ducatis of V4 MotoGP engine. The dimension and the geometry of its cylinder heads are identical in both the GP version and this engine. The Supersport is now the seventh new model from Ducati been launched this year. 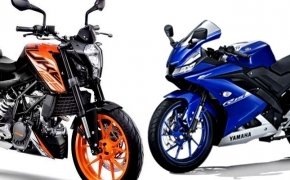 Here's an overview of the Supersport and Supersport S in terms of looks and design, engine, performance, electronics and equipment. 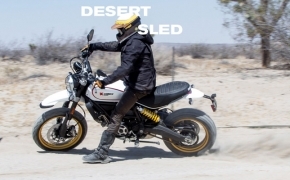 It isn’t just a SCRAMBLER with off road tyres and increased height; it’s practically a new bike. 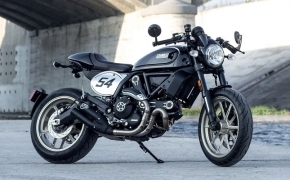 So let’s see what the R&D at Ducati has come up with to carry the already successful Scrambler brand to new heights. The word Multistrada is Italian for 'many roads '. 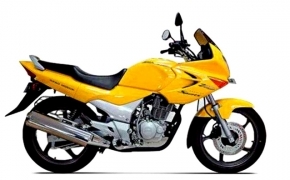 The motorcycle is designed to handle all kinds of road conditions, be it normal roads or off roads. 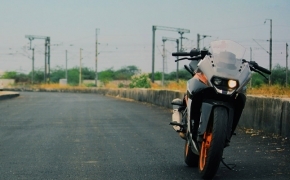 The motorcycle is a hybrid of a supermoto and a sports touring machine. The motorcycle looks completely different when it is seen in flesh, it looks so damn huge, and masculine and can be an eye grabber the next moment it passes you. 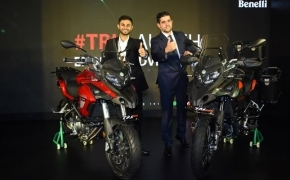 Ducati launched the Multistrada 950 on 14th June 2017 in Delhi at a price tag of INR 12.60 lakhs. 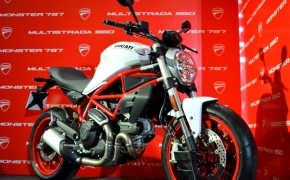 Ducati India unveiled its most affordable offering, the Monster 797 at a very attractive price tag of Rs. 7,77,000 (Ex showroom Delhi). 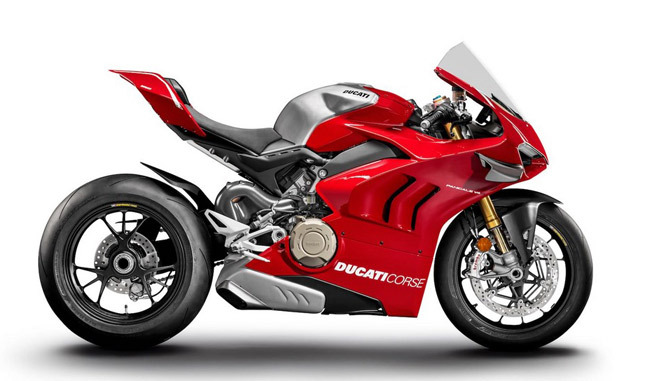 The new Monster 797 replaces the very familiar discontinued yet superb Monster 796. 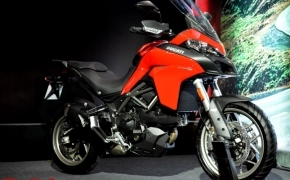 Alongside the Monster, the smaller and less expensive adventure motorcycle- Multistrada 950 was also launched. Here is a quick overview of the new Monster 797 in terms of looks, performance, equipment and pricing.